Dental care experts report that without proper oral hygiene, 75% of dogs show signs of dental disease by three years old. As a result, your dog’s dental care should be emphasized now more than ever; with the ever-growing selection of foods, treats, other delectables comes an even higher prevalence of dental disease in dogs. Canine Gingivitis, gum infections, and other periodontal problems create harmful bacteria which can get into your pup’s bloodstream and damage her heart, lungs, liver, intestinal tract, and kidneys. Familiarizing your pooch with home dental care is the best way to ensure long-term oral health. Coupled with regular veterinary check-ups, most irritation and tartar formation can be treated in the early, preventable stages. Before you can successfully care for your pooch’s pearly whites, you should first learn how the teeth develop and operate. Let’s start from the beginning. Dogs are born without any teeth and then grow them two to three weeks later. At two months, puppies have about 28 temporary teeth, including incisors, pre-molars and cuspids (“canines”). But these temporary teeth are short-lasting; dogs begin losing them 1 month later. 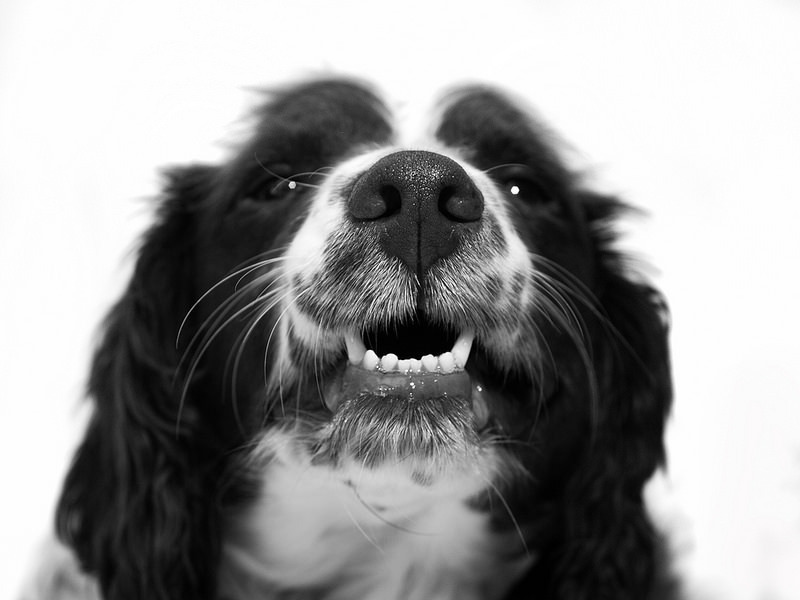 By the time they reach six months, a dog has roughly 42 permanent teeth. As with human infants, this period of a dog’s life is marked by severe discomfort and pain. Most dogs—like human babies—will chew relentlessly and mouth anything in sight to ease the irritation. An adult dog’s mouth typically includes 12 incisors (the small front teeth) which are used for personal grooming and picking up small objects. Alongside those, four long, pointed cuspids allow your pooch to puncture food and other large pieces. These edible chunks are then passed to the middle of the mouth where 16 premolars begin slicing; finally, 10 molars in the very back grind and crush the remaining fragments into digestible portions for easy swallowing. First and foremost, you must remain aware of what your dog eats and plays with. Compressed rawhide bones, knobby rubber toys, and dental chews are critical components of dental hygiene; these products aren’t hard enough to damage teeth and actually assist in the tartar-removal process. On the other hand, small toys and most real bones should be closely monitored, since they can pose significant problems if they’re broken into pieces and then swallowed. Ongoing oral hygiene for your dog is actually quite simple. There are just a few basic steps to learn. In fact, the most important factor is not so much the length or duration of each individual brushing or grooming session, but rather in the consistency with which you do it. It’s far better to clean your dog’s teeth a couple of minutes every other day than to have a single marathon brushing once per week. There are several toothpastes and toothbrushes designed especially for dogs at the pet store. Oh, this is a great time to advise you not to use any toothpaste or other oral hygiene product designed for people (i.e. Crest, Colgate, etc.) with your pooch. People ‘paste contains irritants, bleaches, and fluoride, which is not good for the stomach. Of course, we humans typically spit and rinse out most toothpaste residue, but our four-legged pups aren’t likely to follow our lead. They only know two actions: chew and swallow. If you’re just starting out, we recommend the finger brush, a small hood worn over your finger with soft rubber bristles on one side. A similar product is used for human infants, and the principle is the same. You’re using a familiar object (your finger) to introduce the dog to an unfamiliar experience (teeth brushing). Oh, and while you’re inside the mouth, be sure to massage the gums and check for any signs of tartar, which appears as a dark yellow film typically where the tooth meets the gum line. Once your pooch adjusts to the finger brush, you can later upgrade to a regular dog toothbrush. The actual brushing method is also important. To insure maximum effectiveness, try to keep the brush at a 45-degree angle, and be sure to spend time cleaning each tooth and gum line. Spend 1 minute making small circular motions, followed by an additional minute of vertical strokes. This two-minute, two-step process should dislodge those pesky food particles and discourage the formation of plaque. Ideally, try to brush your dog’s teeth several times a week. Due in part to their non-acidic saliva, cone-shaped teeth, and natural chewing habits, dogs rarely have tooth decay. However, if you notice chronic bad breath, oral bleeding, or other unusual periodontal activity, seek immediate veterinary attention. Infection is likely present, and professional help is necessary. If your allergies have kept you from adopting a loving pup, you’re not alone. Millions of people have some form of allergic reaction to dogs, which can range from minor skin irritation to life-threatening anaphylactic shock. But if you’re willing to do a bit of homework, then you’ve still got a shot at dog ownership. Despite your reaction to most canine breeds, you may be able to bring a hypoallergenic dog into your home. Note: The concept of a “hypoallergenic dog” has been debated for years. Many believe the low-allergy breeds reduce allergic reactions as promised, while others are skeptical and think the concept of a “low-allergy” dog is a silly marketing ploy. As objective observers, we encourage you to speak to your dermatologist in addition to a local veterinarian for specific details and advice. But for the purpose of discussion, let’s review some common questions and concerns relating to the celebrated hypoallergenic dog breeds. Non-hypoallergenic dogs tend to shed a lot. This is because their fur is often loose and dense, which traps pollen, dust, and dander. As the dog sheds its coat throughout the day, these particles are released into the air, carpet, couch, car, and anywhere else your pooch roams. Eventually, the allergens find their way onto your skin and eventually into your mouth and nose. These dogs may also have an undercoat, which is an additional thick layer of fur that protects them from harsh temperatures, water, or other environmental conditions. The undercoat is another culprit in allergic reaction as it can also trap dander is also shed frequently. Also, some non-hypoallergenic dog breeds salivate more often than other breeds, which also leads to more allergic reactions. This is because dog saliva contains bacteria that many people are allergic to. Of course, a dog can’t control the amount of saliva she produces, so if you’re highly allergic, then be sure to select a breed that keeps their doggy spit to themselves. Realize that you can have an allergy to dog fur, saliva, or any of Mother Nature’s particles that are picked up by your pooch. Therefore, the first step you should take is to visit a dermatologist and identify precisely which allergens cause your reactions. Then work backwards to find a suitable breed to match your allergy profile and lifestyle. 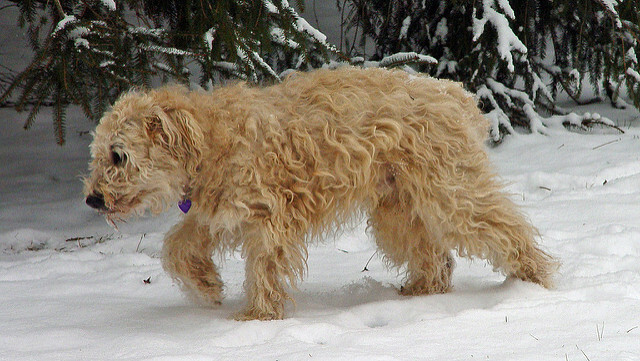 Hypoallergenic dogs have shorter coats, and many don’t have an undercoat at all. While this lack of extra fur makes most hypoallergenic dogs unprepared for extreme climates, these pups may be just what the doctor ordered for allergy sufferers. The hair (notice we’re not calling it “fur” anymore) on these dogs is similar to that of humans, which means it typically won’t shed as frequently as non-hypoallergenic dogs. In fact, for low-allergy dogs, the hair may need to be trimmed regularly to prevent it from growing too long. And if hair itself is the problem, then some hypoallergenic breeds don’t have a coat at all. Oh, and here’s your trivia for today, a dog is considered “hairless” even if it has some hair on the paws and head. Also, hypoallergenic dogs don’t salivate as much as other breeds. As a result, when your pooch is cleaning herself, she’ll leave less bacteria behind. As always, consider your lifestyle before selecting any dog, as this will impact your pup on a daily basis. Remember, smaller dogs are generally better for apartment living because they tend to have a quieter bark and require less room to run around. On the other hand, if you have a house, then you don’t have to worry about the upstairs neighbors, and you may also want to consider a larger breed that will be able to fully enjoy your huge backyard. Here are five of the most popular hypoallergenic breeds. Of course there are dozens of other breeds for you to choose from, but we want to suggest a few to get you moving in the right direction. What’s your favorite low-allergy breed? Be sure to leave a comment and let us know! Among the most popular dog breeds in general, the Poodle is usually the first low-allergy breed that comes to mind. 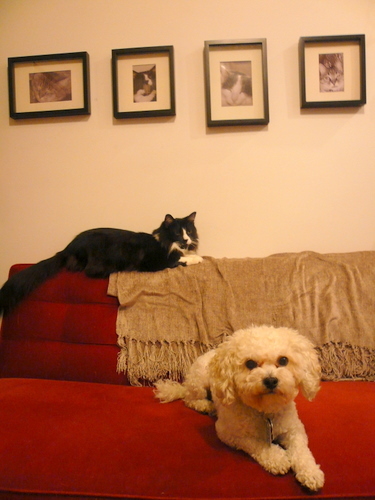 Aside from the hypoallergenic qualities, a wonderful trait with Poodles is their versatility. Depending on which version you select: miniature or standard. Poodles are sporting dogs, service dogs, show dogs, guide dogs, and even lap dogs. It’s a very friendly breed and thrives on physical exercise, mental games, and constant human interaction. The Poodle is also considered one of the smartest and most obedient of dog breeds. They blend a spirit of adventure and playfulness with an irresistible personality that most people find adoring. The Poodle enjoys running, swimming, retrieving, and any other outdoor activity. They are also excellent with kids and other pets. The Chinese Crested is available in two varieties: the Hairless and the Powder Puff. Both are considered hypoallergenic. The Hairless, which is more common, actually has hair on its paws, head, and tail. The Hairless Chinese Crested loves to play outside, but due to its hairlessness, doesn’t fare well in cold weather. Actually, because they’re so small, you can exercise a Crested by just running it inside the house. These dogs love to jump and climb any everything, so be sure to maintain tight security to prevent injury or escape. Grooming requirements call for regular trimmings of the head, neck, tail, and feet. The Hairless Chinese Crested is prone to sunburn and acne, so be sure to purchase your pup a soothing moisturizer to keep her skin healthy and, for those outdoor days, an SPF-rated sun block. Aside from the skin care concerns, the Crested is very friendly and enjoys spending time with people and other pets. These cuties are perky, playful, and maintain an overall happy-go-lucky outlook towards life. The Bishon is responsive, loving, and gets along great with children. On that note, Bishons require regular human contact, so don’t plan on leaving this pooch home alone all day while you’re at work. As for grooming, the Bishon Frise does not shed; however, some hairs may loosen and get entangled with the rest of the coat, causing it to mat. So you’ll need to brush your Bishon a few times per week to keep her tangle free. Also, the white puffy coat-a Bishon Frise signature- will need regular washes and trims. The Portuguese Water Dog absolutely thrives on human interaction, so personal attention is in high demand for anyone who owns one. An active lifestyle is also essential because these dogs can’t sit still for very long without being overtaken by the urge to run around. The Portuguese makes an outstanding family pet since they love children and other dogs. They have an endless amount of energy and will play all day long if allowed. Excellent swimmers, they are the perfect dog for boating trips, fishing expeditions and water games at the lake. If bored, the Portuguese Water Dog will become frustrated and destructive, so unless you want chew marks on the sofa, do not keep this breed cooped inside all day while you’re at work. Grooming requires a thorough brushing every other day, with professional clipping about once a month. The Portuguese Water Dog is not bred as often as the other hypoallergenic breeds, you’ll likely have to search for a breeder online until you find the Portuguese pup of your dreams. The Soft Coated Wheaten Terrier is an athletic and playful member of the Terrier Group. Fun-loving and always ready for the next adventure, these dogs are a joy to have around the children. Always on the lookout for a new friend, be it human or canine, the Soft Coated Wheaten Terrier is friendly and ready for training. The Soft Coated Wheaten Terrier is available in four varieties: Traditional Irish, Heavy Irish, English, and American. The main difference is the size of the dog. This breed has a short coat that doesn’t shed much during the day. However, they will need to be groomed regularly to prevent clumping, matting, or skin rashes. The Soft Coated Wheaten Terrier thoroughly enjoys exercise and wants to be around people as much as possible. But due to their size and energy levels, we don’t recommend this breed for apartment living. The Wheaten Terrier loves to run and bark, so a large backyard is a necessity. This is a largest dog on our list, so if the hypoallergenic toy breeds turn you off, then take a close look at this big contender. Can Aquarium Plants Grow in Rocks?